Madeira may be tiny, but this subtropical paradise offers world-renowned gardens, spectacular coastlines and jagged peaks, while picturesque Funchal boasts an architectural charm and rich maritime heritage to match the islands natural splendour. Rising from the ocean floor 600 miles southwest of Lisbon, Madeira is a subtropical paradise that captures the hearts of all who visit. Even the difficult-to-please Winston Churchill was seduced by its charms! The largest island in an archipelago, Madeira has a huge range of landscapes within its tiny surface area, just 35 miles long and 13 miles wide, from sunny beaches in the south to jagged peaks and cliffs in the north. Its topography  a mountainous backbone and plateau running along the centre, riven by steep valleys  was forged millions of years ago by intense volcanic activity. With fertile volcanic soil, Madeira is a plant-lovers dream with an enormous diversity species, from imported purple-blossomed jacaranda trees, orchids and bird of paradise plants to its native Laurisilva forest. So much flourishes here in its mild climate all year round, making it a superb destination through autumn and winter. In legend, Madeira was one of the Isles of the Blessed, a winterless earthly realm inhabited by heroes of Greek mythology. But it was serendipity that led the Portuguese here in 1418 when Jo£o Gon§alves Zarco was blown off course and set eyes on Porto Santo, the northernmost island in the archipelago. A year later, Zarco returned to find another forested island, claiming it for Portugal and naming it Mad¨re after the Portuguese word for wood. New settlers were delighted to discover that it was ideal for crops, including bananas, grapes and sugar cane, and virtually any spare patch of land is now cultivated, resulting in hillsides covered in terraced fields and levadas, or irrigation channels. The seafood, unsurprisingly, is exceptional and there is an abundance of fish to sample, from the ferocious-looking black scabbard fish to marlin and albacore tuna. Also popular are dishes such as espetada  beef marinated in Madeiran wine, then grilled over smouldering wood chips. Bolo de mel or honey cake is a traditional pastry locals insist should be torn into pieces by hand and never cut with a knife, while fried dough balls called malasadas are enjoyed on Mardi Gras, which is celebrated with gusto. Madeirans are devoutly Catholic, but they also enjoy a multitude of festa or festivals, many in honour of the islands flora. One of the wonders of visiting Madeira is that so much is packed in, from inspirational gardens to thundering waterfalls and from soaring peaks to the hidden Valley of the Nuns. Our tour begins in the picturesque capital, Funchal. You will be greeted at the airport by a member of the Riviera Travel team to help you check in for your flight to Funchal. Upon arrival, you will be escorted to the five-star VidaMar Hotel. Settle in before rejoining the group this evening for a delicious welcome dinner: the perfect opportunity to meet your fellow travellers. After breakfast, a local guide takes us on a walking tour of the historic centre of Funchal, often called little Lisbon as it overlooks a spectacular harbour and boasts grand 18th-century buildings with shaded courtyards. Narrow streets wind through its centre, broadening out onto lively squares and tree-lined walkways. Inspiring sights include the Igreja do Colgio, a church with a plain exterior that belies its sumptuous Baroque interior, and the 15th-century S cathedral, one of the few buildings dating from colonial times. It is the islands main religious building and features the original 16th-century altar, imposing arches and ornate gold-framed paintings; its ceiling, made from local wood, is one of Portugals most beautiful. Devotees of modern architecture will love the Art Deco Mercado dos Lavradores or farmers market, a hive of activity as shoppers fill their baskets with the islands sun-ripened produce. Look out for the patterned pavements, typically Portuguese and painstakingly pieced by hand, and for the colourful street art on the doors of buildings. A treat is in store as we pause for a tasting of the islands best-known export  Madeira wine. The process of heating the wine originated by accident when 16th-century sailors discovered that wines picked up in Madeira tasted richer after the casks had been heated and cooled during passage through the Tropics. Today, the styles of this fortified wine range from dry to lusciously sweet. In between is medium Verdelho, the variety the British traditionally serve with the crumbly sponge cake named after the wine. 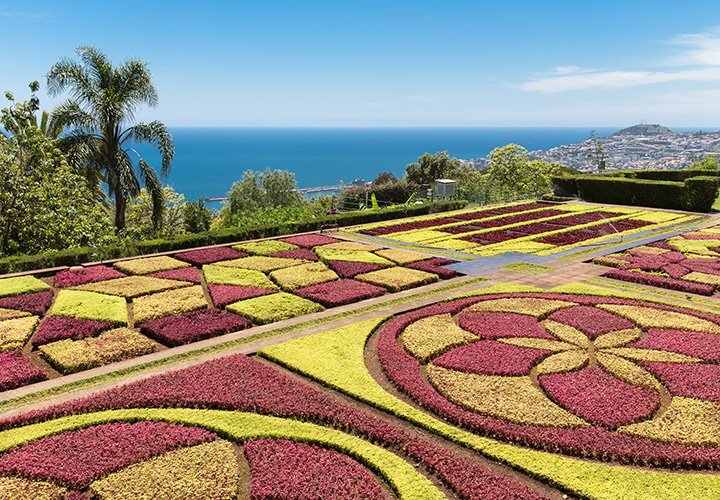 In the afternoon, we visit the Palheiro Gardens, world famous for its variety of flora and its beautiful setting in the hills overlooking Funchal. Palheiro was laid out in the early 19th century by a French landscape architect for the Count of Carvalhal before being acquired in the early 20th century by the Blandy family, famous wine producers. Over the next decades, the gardens were populated with thousands of plants from around the world, from North American sequoia trees to South African Proteas, all flourishing in Madeiras rich soils and clement weather. This is a blissful place to explore at your leisure, taking in all the colours and fragrances, with a chance to linger when a particular specimen catches your eye. Today we explore the western side of the island. Our first stop is Cabo Gir£o and the spectacle of the islands highest sea cliff  a sheer drop of 1,980 feet. Experiencing the views from the transparent viewing platform extending over the cliff edge is truly exhilarating. We next visit charming Ribeira Brava, a small town set in a steep valley carved out by the wild river that gives the settlement its name. Theres ample time to explore its picturesque streets and visit the 16th-century church of S£o Bento with its giant crystal chandeliers. Madeiras tropical climate is perfect for growing bananas and in the fishing village of Madalena do Mar you can experience life on a small banana plantation, where much of the work is still carried out by hand. Turning inland, we ascend nearly 5,000 feet to the flattest part of the island, Paºl da Serra plateau. This landscape is reminiscent of Dartmoor and the North Yorkshire Moors  a surprising contrast to the mountain scenery we have enjoyed elsewhere. In the distance you can see Porto Moniz, located at Madeiras northwestern tip and our next destination. Remarkable enough for its edge-of-the-world feeling, Porto Moniz is also blessed with natural saltwater pools, formed from solidified volcanic rock and replenished by the waves as they break against the rocks. Its the perfect place to stop, gaze out over the waves and drink in the invigorating ocean air from the terrace of a caf or restaurant. We return on the northern coastal route via the village of Seixal to see one of Madeiras most famous waterfalls  the Bridal Veil  cascading down the side of the mountain into the sea. Our final stop is S£o Vicente, a village nestling in a deep verdant valley and believed to be the volcanic birthplace of the island. At its shore is a giant basalt outcrop into which is hewn a 17th-century chapel, while the village also features a distinctive black and white church, scenic houses and a network of caves  all adding to its reputation as one of Madeiras loveliest settlements. After taking in so much, its time to return to Funchal. Near Funchal is the idyllic hilltop town of Monte, which we visit this morning. Enjoying spectacular views of the capital and the southern coast, it has long been a retreat for wealthy families. The towns landmark is its 18th-century church, the most important pilgrimage site in Madeira, with its black and white facade and twin towers. It is also the burial place of Charles I of Austria, the last ruler of the Austro-Hungarian Empire. Youre free to wander at leisure or join a guided visit to the Monte Palace Tropical Garden. These oriental gardens are exquisite, complete with Asian-style bridges, arches and a pond filled with koi carp; they also house a historic tile collection gathered from Portuguese palaces, churches and private residences. Later we return to Funchal by coach, or you may wish to take the cable car for a dramatic 15-minute descent to the capital. If youre feeling really adventurous, you could take the famous Monte toboggan ride. This involves descending the narrow streets in a cushioned wicker basket mounted on wooden runners, steered from the rear by skilled drivers  Ernest Hemingway described the experience as exhilarating. This afternoon is free. Why not relax at the hotel? Or perhaps visit Quinta das Cruzes, the former home of Jo£o Gon§alves Zarco, and now a museum whose exhibits offer a fascinating insight into the lifestyles of the islands wealthy merchants over the centuries. The whole day is at your leisure. Maybe make full use of the hotels facilities or choose to explore Funchal. For art-lovers, the Sacred Art Museum is located in the 17th-century former bishops palace. It houses one of the finest collections of religious art in the world, commissioned for their local churches by wealthy Madeiran merchants seeking salvation. Among the works are masterpieces by influential 15th- and 16th-century Flemish painters, such as Pieter Coeck van Aalst. If you didnt take the cable car at Monte, why not give it a try today? Alternatively, a steep path leads up to S£o Jo£o do Pico, the impressive fortress that has kept guard over Funchal since the 17th century and which offers a superb panoramas over the city. You can also experience Funchals traditional craft shops, many individually decorated and offering artisan tiles, wickerwork and embroidery, before a stroll along the Lido promenade and a seafood lunch. Gardeners, already spoilt by Madeiras flora, can indulge themselves further at the Botanical Gardens. Today we explore the eastern seaboard, passing diverse landscapes from craggy coastlines to ancient forests. Ponta do Rosto is Madeiras easternmost point, on a sliver of land jutting out into the Atlantic, and offers dazzling panoramas. On clear days the island of Porto Santo shimmers in the distance. Following the northern coast, we call at sleepy Porto da Cruz, named after a large cross displayed to identify it to passing sailors. Dominated by the sheer-sided Penha dAguia or Eagle Rock, this 16th-century parish is renowned for producing sugar cane spirit and a dry red wine made from the Americana grape. We leave the village and track the coastline, where, incredibly, every patch of land is farmed to provide food for its isolated communities. Theres further proof of Madeirans capacity for self-sufficiency in Santana, a town notable for its A-frame thatched houses. Made from stone, wood and anything else to hand, they have brightly painted doors and windows and each sits on its own plot of land used to grow food. As you enjoy a stroll around these well-preserved 16th-century dwellings, you get a sense of what it was like to live here when villagers relied solely on their own toil for survival. We head towards the mountainous interior and one of the highlights of the tour  the UNESCO-listed Ribeiro Frio National Park. Around 90 per cent of the park is covered by ancient Laurisilva or laurel trees, and the area features many endemic flora and fauna, such as ferns and the trocaz pigeon. The region also plays a vital role in Madeiras ecosystem, as moisture captured by the trees feeds into a 1,355-mile network of channels that distribute water across the island for drinking, agriculture and hydroelectric power. Ascending slopes cloaked in fragrant eucalyptus and swirling mists, we emerge at Pico do Arieiro, Madeiras third-highest mountain at 5,930 feet. Here, above the treeline and sometimes even higher than the clouds, the vistas are some of the most memorable youll ever see. You may even spot the Valley of the Nuns way below. On clear days almost all of Madeira is visible, including its highest summit  the 6,100-foot Pico Ruivo. Our morning begins with a short drive north to Madeiras dramatic interior and the Curral das Freiras or Valley of the Nuns. To appreciate the solitude of this place, we drive to Eira do Serrado, over 3,500 feet above sea level, part of a natural cauldron of jagged peaks and chasms, with time to soak up the glorious views down to the village of Curral das Freiras itself. Descending to the village, you can see why in 1566 the nuns of Funchals Santa Clara convent relocated to this almost inaccessible valley to flee a pirate attack. Today it is also known for the sweet chestnuts cultivated on its terraced hillsides  youll enjoy sampling these tasty treats. It even hosts an annual festival celebrating this versatile nut, which is used in products from cakes to soups to liqueurs. After lunch, we head to C¢mara de Lobos, a fishing village built around a bay with Europes highest cliffs forming a breathtaking backdrop. Inspired by its location, the colourful boats and whitewashed buildings with distinctive terracotta roofs, Winston Churchill stayed here to paint the harbour during his visit to Madeira in 1950. C¢mara de Lobos is still a working port, with boats pulled up onto the beach after night fishing for the local black scabbard fish known as espada. Its a charming village to saunter, exploring the cobbled streets and visiting the simple Saint Anthonys Chapel, where fishermens wives traditionally said prayers for the safe return of their menfolk. Or you can relax in a harbour caf with a glass of poncha, an elixir of sugar cane spirit, honey and lemon juice enjoyed by the fishermen returning to land their catch in the morning  and said to cure the common cold!